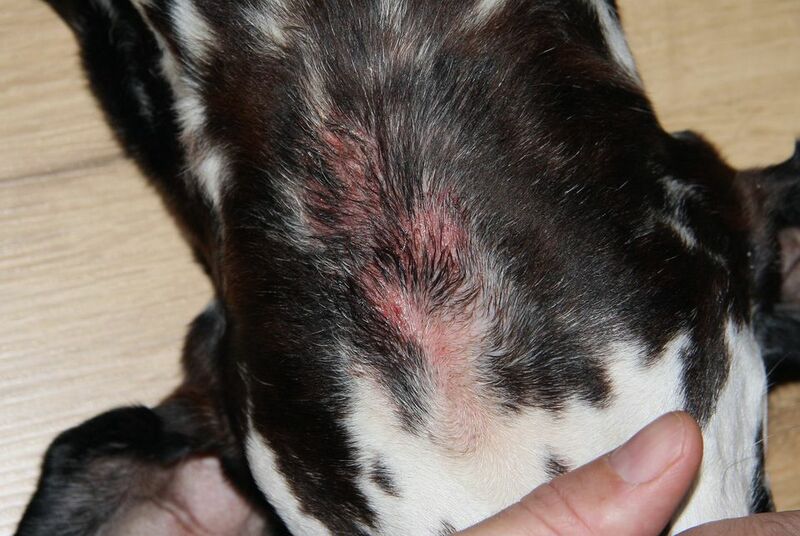 Dogs can develop a hot spot anywhere they lick, scratch, or get a small injury. Your dog can be quite agitated over a hot spot, so it is good to know how you can help your dog get some relief. Learn what you can do for a hot spot while awaiting your veterinarian's examination and advice. A hot spot is a localized area of skin inflammation and infection. You will see redness, oozing, pain, and itchiness, and there can be hair loss or matting. The first thing to do is speak with your veterinarian and make sure you are dealing with a hot spot and not something else. These tips are not meant to replace the recommended trip to the vet, but rather, offer your pet some quick relief and to help quell the spread of the hot spot until your vet can see your pet. Due to the rapidity of spread and possibility of deeper skin infection, it is wise to start treatment with your vet. Also, these hot spots can be very painful to the animal and you should use a muzzle for your protection. Shave the area. The first treatment for hot spots is to dry them out and get air to the area. Hair loss is a feature of hot spots, but hair can also mat over the inflamed area, covering up a potentially much more severe and large problem. Because most hot spots are very itchy and painful to the pet, so it's best to leave the initial shave/clean-up to your veterinarian. Some animals need sedation to do this. If you attempt to shave the affected area at home, please take appropriate precautions. Cool compress the area two to four times a day with a cool wet washcloth. Medications: Depending on the severity and size of the hot spot, your veterinarian may prescribe oral antibiotics, topical drying sprays or medications, and/or special shampoos. Prevention of licking, biting, scratching: Your dog will need an Elizabethan collar or "E-collar" cone or alternative. Topical wound-healing spray to relieve, soothe and heal. One product that is non-toxic if ingested and promotes wound healing is Vetericyn spray or gel spray. Domeboro's (Burow's) solution (aluminum acetate): This is available over-the-counter at pharmacies to help dry the skin out. It can be used as a compress or as a spray. Hydrocortisone creams: A thin film of an over-the-counter hydrocortisone cream may give some immediate relief, but do not use in an area that can be reached by licking.